UPDATED: (28/02/17) to include custom swatches. Worn Stucco Wall Set. 10 x Worn Stucco Walls with cherry wood moldings. Each wall is compatible with all 3 wall sizes and these walls can be found in the Paint/Masonry Category. UPDATED: (27/02/2017) to include custom swatches. Another day of hibernating inside Photoshop. This is another part of the Painted Wood Panel range that I am a little obsessed with. 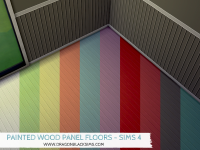 These are Set 1 of the Floors I am working on that coordinate with all the walls. UPDATED: (26/02/17) to include custom swatches. 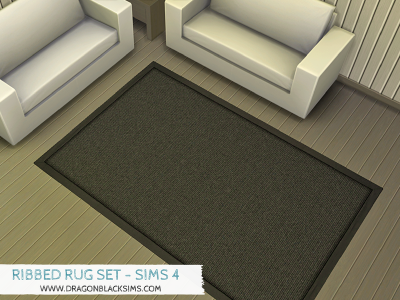 This is a brick texture I originally made for Sims 3 as a pattern. 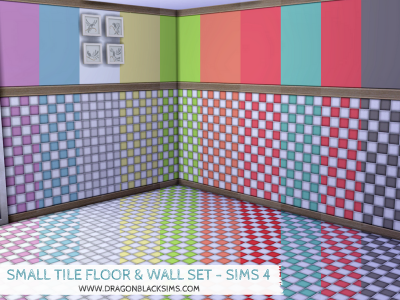 I loved it so much I couldn’t wait to add it to Sims 4 as a wall set. The set consists of 7 brick walls in a variety of colors with coordinating grout. I really hope you enjoy using these in your game. As always, these walls are compatible with all 3 wall sizes. 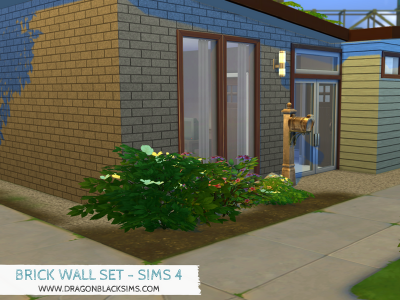 These Walls can be found in Build Mode – Masonry. FHRA requested these walls with a lighter grout finish. So I have added the file below. You can have both versions installed if you wish. I have also added screenshots. 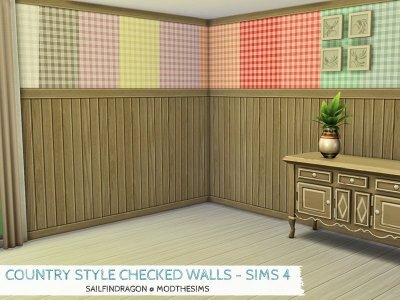 This is the Country Style Checked Walls. Oak Wood Panels with Moldings & Checked Wallpaper upper part. Each wall is compatible with all 3 wall sizes and comes in 10 color variations. Can be found in Build Mode -> Wallpaper or Paneling Category. Well, I have been working away in Photoshop for the last couple of days, working on some new goodies. 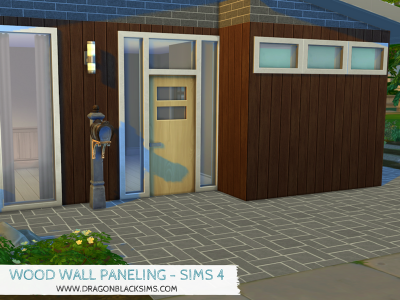 I seemed to have taken a liking to creating wall panels. UPDATED: (17/02/2017) to include custom swatches. 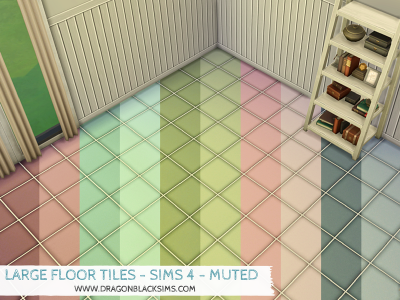 The Large Floor Tile Set in Muted colors. This set has 10 muted color variations with a deep set gritty grout. Hope you enjoy. Happy Simming. Like my other creations, this is a custom texture made entirely by me. So, if there’s a color I have not included within this set that you would like to see in your game, feel free to let me know and I will see what I can do. UPDATED: (15/02/2017) to included custom swatches. The Stone Tile Wall & Floor Set consists of 10 Floors in a variety of two-tone muted natural colors. Included in the set, is 10 Half (more like 3 quarter) Tile Walls with white wood base skirting, white wood dado and painted upper half. Both walls & floors have a white grout finish in the tile area. As always each wall is compatible with all 3 wall sizes. Cost: Walls: 2, Floors: 1. UPDATED: (15/02/17) to include custom swatches. Another day of hibernating inside Photoshop. 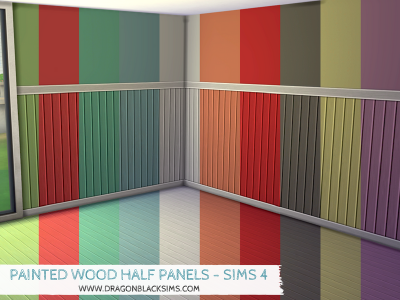 Part of the Painted Wood Paneling range that I am a little obsessed with. This version has white wood moldings and a painted upper-half. Each wall is compatible with all three wall sizes. Hope you enjoy. Happy Simming. Like my other creations, this is a custom texture entirely made by me. So, if there’s a color I have not included within this set that you would like to see in your game, feel free to let me know and I will see what I can do. 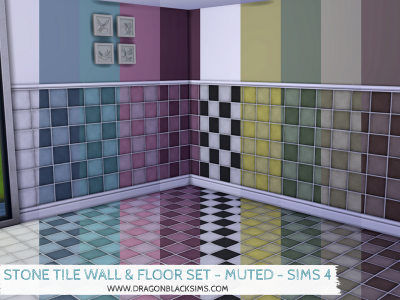 The Small Tile Wall & Floor Set consists of 11 Floors in a variety of two-tone colors. 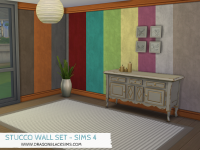 Also included in the set, is 22 Half (more like 3 quarter) Tile Walls with white & oak wood base skirting, mid-height rail, painted upper half and upper molding. Both walls & floors have a white grout finish in the tile area. As always each wall is compatible with all 3 wall sizes.